I could probably write several long chapters about how much I don't like winter and how much I despise walking in the rain. But I'll stop and quietly dream about the warm summer days. Our dogs seem to take after us and avoid the rain as much as they can. Jake goes out of his way to hide inside the house when we ask him to go for a potty break outside. It's just too bad that he's so big and we always find him. We keep repeating "Jake, go outside!" and he keeps avoiding his obligation. He goes outside and makes a quick u-turn when he realizes it's cold and wet. 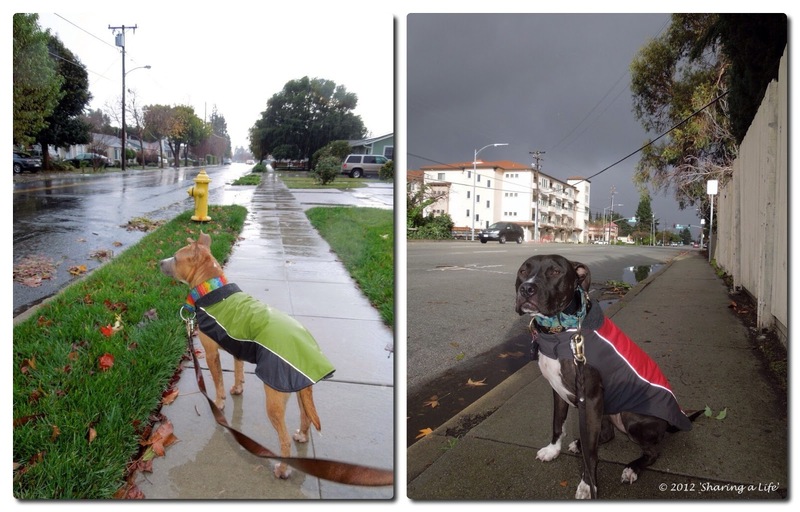 Abbey tolerates the rain, when we put a rain coat on her. While Pete goes for the more dramatic approach. He won't step a foot in the water, he looks like a leaping frog jumping over the puddles on our walks. And when it rains he drags his heals and squints his little eyes. Today the weather has been crazy, one minute sunny the next minute heavy rain. While I was walking Oliver, he couldn't care less about the rain and was very optimistic about seeing squirrels. While I was trying to be optimistic about having one walk without the rain today. On my second walk, we almost made it home dry. If only Pete was walking a little bit faster. He seems to slow down when you dress him up. When we were five minutes away for home, the sky turned black...I didn't need to see a forecast to know that it was going to be heavy rain again. Sure enough! Within a couple of minutes we were soaking wet, Pete looked like a drown rat and didn't want to walk. I had to pick him up and Abbey was glad to speed up. Even though we're not very big on Christmas decorations at home, we look forward to walking through our neighborhood to checking out the Christmas lights. 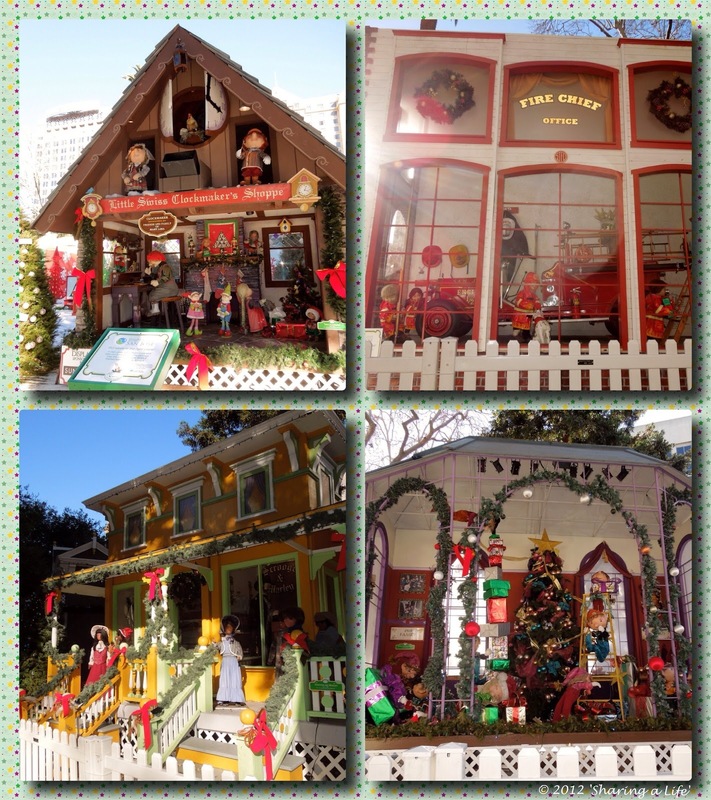 We live close to Willow Glen and they're very festive and big on the Christmas Cheer. I've been planning on expanding my daily walks to explore downtown San Jose. I used to look at the Christmas decorations from the light rail when I was passing through, but never had the chance to see them close up. They have the most beautiful Christmas in the Park decoration. I only wished I had checked if dogs were allowed to walk through the park. I just assumed that since it's in the public place and they don't have any restriction in this park normally that we would be okay. Sadly they had signs on every corner and entrance to the park 'no dogs allowed', so we were peering in from the outskirts of the park and making a googly eyes at the beautiful decoration. I didn't think the dogs would get kick out of this, but it's something that I wanted to see and visit for many years. But usually when I'm done walking dogs, I don't feel like going out for another walk by myself. Today I walked close 10 miles (between all of our dogs), but it was worth it. Pete and Abbey had a great time watching all the Christmas decoration, it was Christmas Cheer overload - moving decorations, music and lights. I think Abbey would have loved to take the Clockmakers Shop home, she stood there watching in amazement. She still gets mesmerized when she hears a rooster and she loves bubbles, so you can imagine her surprise when she saw her two favorite things all at once. Christmas Cheer ♥♥♥ a video by Alzbeta&Nigel on Flickr. I thought we would have a quiet afternoon browsing downtown San Jose, I forgot about the little kids that don't yet go to school. So we had to negotiate lots people who wanted to check out the Christmas decorations also. Abbey and Pete don't know how to act casual and lay low...when I asked Abbey and Pete to sit in front of the big Christmas tree to have their photo taken; Pete thought the ground was too cold to sit on so perched himself on top of Abbey. People thought it was adorable and wanted to take photos of them and meet them. 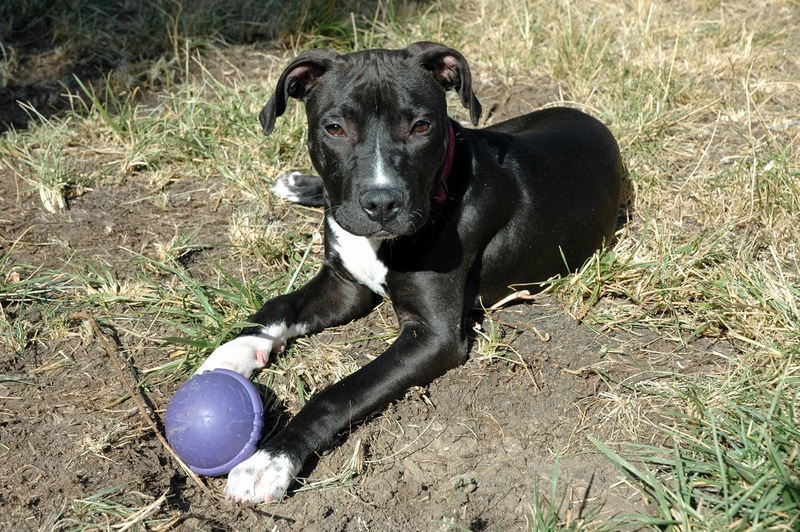 It's been almost three years since we adopted Abbey from the San Martin Animal Shelter. Abbey our first dog has given us a great learning opportunity in to what it's like to own and care for a dog. I still can't believe we didn't return her back to the shelter. She was too smart, even at four months old, and knew how to manipulate us from the day one we got her home. You can read about her first year with us at this blog 'One year since we adopted Abbey...the first six months'. We'll be forever in debt to Our Pack, they helped us so much in our first year with Abbey, including weekly training classes, socialization for Abbey, and tips on how to raise her to be a good dog. Not that Abbey was ever a bad dog, but we did a great job spoiling her and as every spoiled child she behaved like a brat. We had to learn how to give her tough love, and teach her that nothing in life is for free. She had to sit and wait for something instead of grabbing it from our hands or sit and wait to be invited to sit with us on a sofa instead of just jumping all over us and pulling on our clothes (fun times!). Our second year with Abbey became even more fun when we adopted Jake. We found Jake residing at the Hayward Animal Shelter. We had a blast watching these two crazy teenagers falling in love and bonding with each other. You can read more about Jake's adoption at And than there was Jake..... It was almost like they had an inside joke and they would spontaneously goof around together. We're now into our third year with Abbey and Jake, we've watched them grow older and mature into a well behaved dogs. 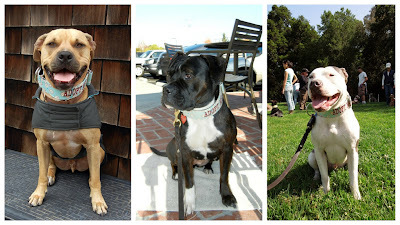 We wanted to keep socializing our dogs with other dogs and also help other dogs to find a home. So we started to foster dogs for Our Pack. 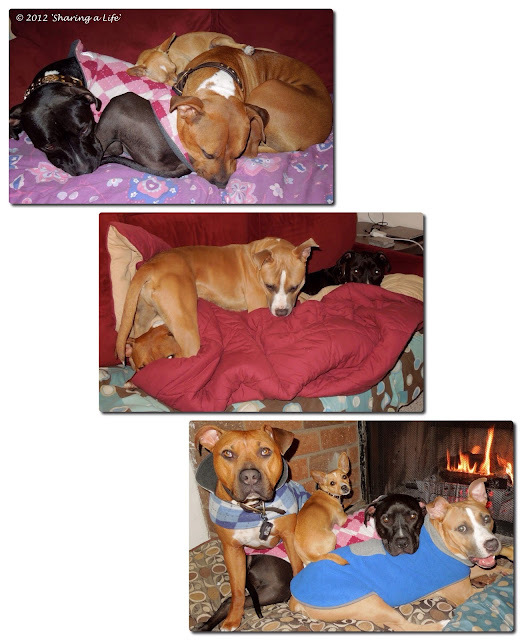 Fostering, gives us an opportunity to socialize Abbey and Jake with a new dog every few months. 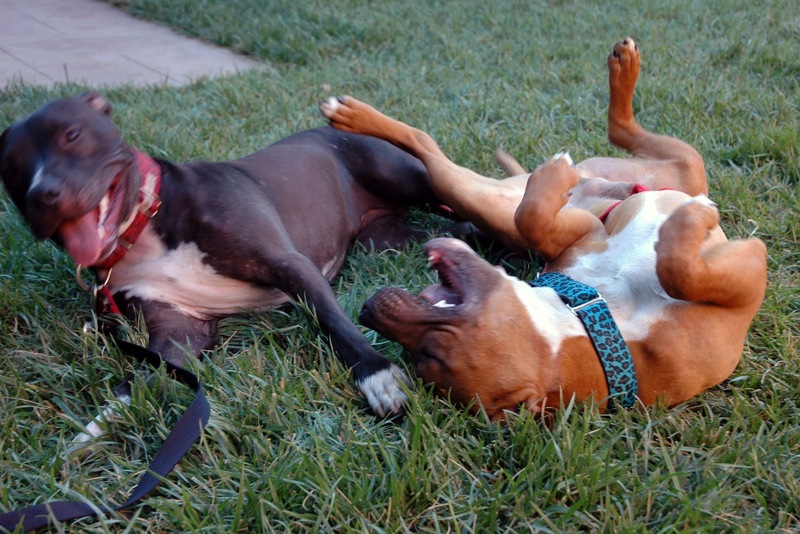 Our dogs have welcomed every foster that has come through our house, they've shown them how to have a good time and how to live within our house, including where to sleep, what do you with toys, what you can chew on and how to play with other dogs. Over the last year we've fostered four or possibly five dogs if you include Petey, who we adopted after a few weeks of fostering :o). Penny, Chevy and Lenny all came from Our Pack. We love fostering for Our Pack as they know our dogs really well and always make sure every foster dog will fit into our family. We also love that whenever we come across a new behavior we can always call Our Pack and ask for help or guidance. 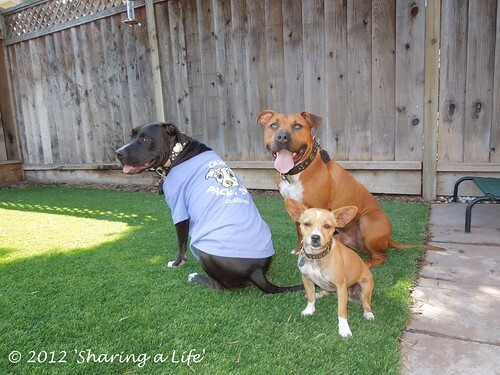 We learn so much from each foster dog and are getting more experienced as a dog owners. At the same time Abbey, Jake and Petey get a new buddy to play with. The last three years have been a blast and we're so thankful to Our Pack for their support. Thank you Our Pack for having our backs and teaching us to be the responsible dog owners. Our Pack Fans, a photo by Alzbeta&Nigel on Flickr. For more adventures about dogs you can visit 'Sharing a Life' on Facebook page. Whenever we drive home on the I-280 I always admire this house located just below the highway on Lincoln Avenue. It looks a picture perfect house with white picket fence and beautiful garden. I found myself dreaming, trying to imagine what the area used to look like before they built the highway and the recycling center across the street. It must have had a great view at one time, possible overlooking a farm or an orchard. I tried walking there once or twice in the past with our dogs and all I remember that right after this beautiful house there's another house with two large dogs that would bark at us profusely as we approached their house through a wired fence. So we didn't spend much time hanging around. Today we deviated from our usual morning walk. As I wanted to withdraw some money from an ATM machine. I then made my to to downtown Willow Glen, on the way, I stumbled upon my favorite white house, we stood there for a while admiring the house. I then noticed a memorial plaque which explained the history of the house. "This historic adobe was built in 1836 by a native Californian, Roberto Balermino, on Rancho de los Coches, which was officially granted to him by Governor Micheltorena in 1844. The one-story dwelling was enlarged in 1847 by the new owner, Antonio Suñol, the second story and balcony were added in 1853 by Captain Stefano Splivalo. " It's hard to believe that in 1853 somebody purchased the house and 55 acres for mere $3000. I'm glad that the city decided against demolishing this historical landmark and build the highway around it. Today the building serves as Law Offices. One compliment caught me off guard, when a ladies voice said 'What well behaved dogs these are!' and then I turned around I saw a policewoman in uniform. I stuttered a reply: 'Yes, they're.' I'm a dork around cops and always get nervous; even though I've never been arrested or even inside a police station. What a fun day; I can't wait to see what else we come across on our daily walks through our neighborhood. Everybody is called Pete a video by Alzbeta&Nigel on Flickr. Lenny is around 20 months old and is not as wide as Abbey, so he can still make it through. Last time we weight him, he was 51.5 lbs. A sculpture called Portal in Bramhall Park by Keith Bush, a photo by Alzbeta&Nigel on Flickr. 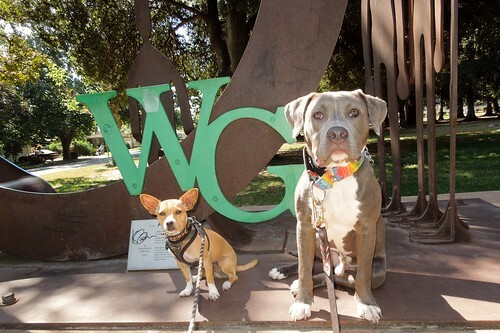 Lenny's favorite walk is downtown Willow Glen, where he gets to meet lots of new friends. Lenny is always confident that people will fall in love with him and want to pet him. I must admit that he really is very good at stopping people in his way. When he sees somebody that he'd like to meet, he tries his best to walk towards them or he just sits down and waits for them to come to him. At times we have to make sure he doesn't apply this technique to bicyclist coming our way or unsuspecting people that could trip over him. But nine out of ten times this works great for Lenny; people are happy to say hi to him. Both Abbey and Lenny are shameless flirts and love to meet people, they're great at starting conversations with random strangers. They would be perfect for a single gal, looking for a new guy or the other way round ;o). Good thing is that Lenny is available for adoption from Our Pack and you can have your own flirty dog to walk downtown and meet new people. Lenny is the perfect companion if you just want to browse downtown or sit outside a coffee shop and just watch the world go by. Recently, we've noticed several new shops opening in the downtown area of Willow Glen, this includes a new chocolate shop, the "Crepevine", "The Table" restaurant, and a new Unleashed by Petco. It's awesome to see the town buzzing with new businesses this year. We also noticed an upcoming event Taste For Trees, Willow Glen Wine Walk 2012. A little further on and we saw an artist working on his mural,we stopped and admired his work for a while. I can't wait to see it finished, it's going to be beautiful. There's a surprise behind each corner of Willow Glen. 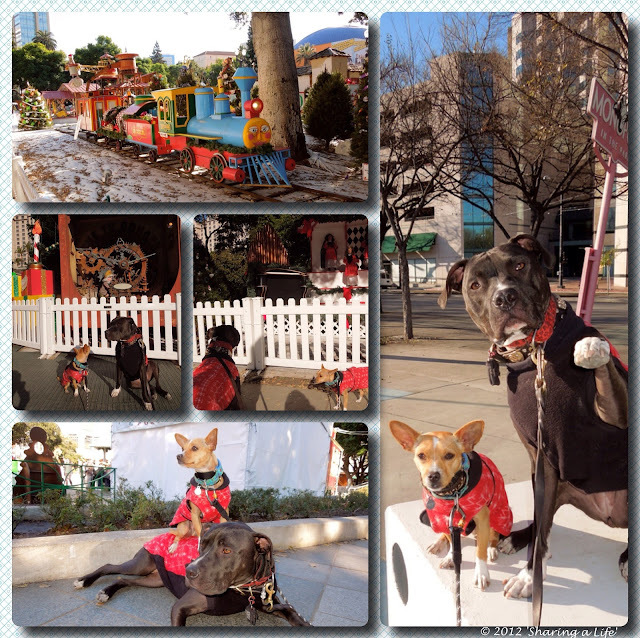 For more adventures of our dogs, you can check our facebook page. DSCN0097, a photo by Alzbeta&Nigel on Flickr. 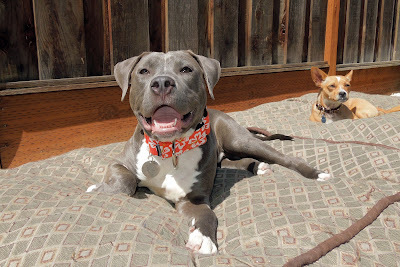 Our foster dog Leonard, is very easy going and fun loving dog. He finds joy in simplest things and is always happy to share with our dogs. 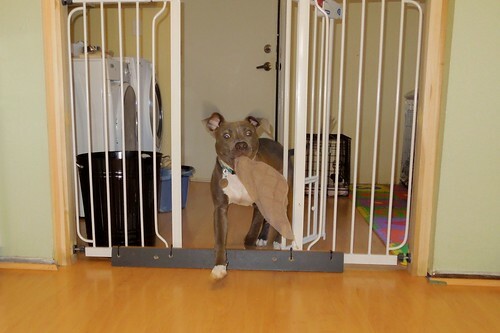 Lenny loves laundry days, all of the sudden the ordinary cloth or sock become a great tag toy. I don't ever remember Abbey or Jake ever having such an imaginative mind as Lenny. Penny, one of our previous foster dogs, used to collect shoes. DSCN6670, a photo by Alzbeta&Nigel on Flickr. Living with dogs, we had to learn to put things away and out of their reach. So I guess we should thank them helping us go minimalist in our house. Roughly three years ago; while volunteering at a local animal shelter we happened to be socializing a a 4 month old little black dog. We were so taken by her confidence and friendlyness that we decided to adopt her for ourselves. This was the day that our lives dramically changed (forever)! As soon as we could we enrolled Abbey in the Our Pack training class, more for us than for Abbey. Abbey was joined six months later by Jake. As we gained more experience with Jake and Abbey we started to talk to Marthina from Our Pack about fostering for Our Pack. Our fostering started roughly two years ago, in the following two years, we've fostered energetic puppies, calm females, troublesome teenagers and everything in between. We still remember the day when Marthina starting talking about chihuahuas and the bad rap they'd started to receive. At the time we only saw ourselves with large dogs and never imagined ourselves with a small dog. 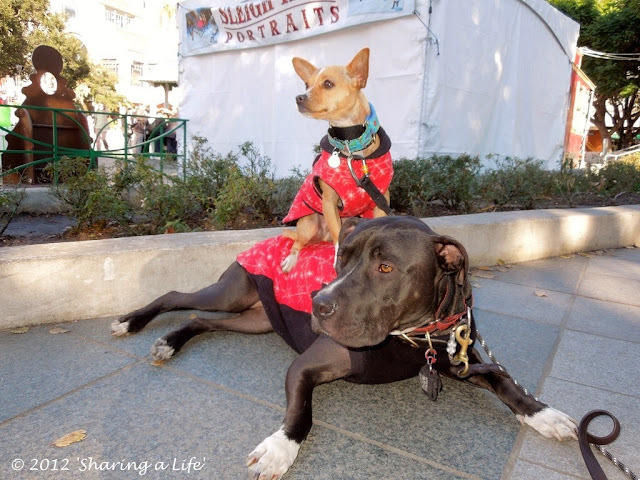 Marthina, continued to talk about the plight of chihuahua's, and eventually we agreed to foster a chihuahua for Our Pack. Marthina found Pete at a local shelter, heavily congested, suffering from Kennel cough, she just couldn't leave him behind. 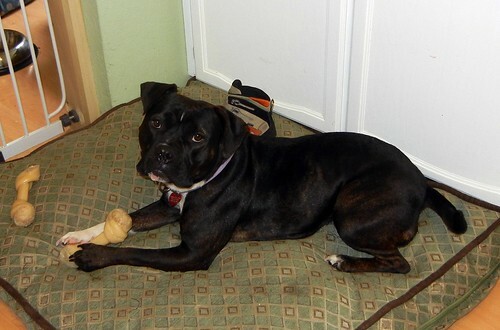 Marthina helped Pete recover from his kennel cough before he came to us. It wasn't long before we started to see the size of Pete's personality and noticed he wasn't so different from Jake or Abbey. Pete fitted in so well with Jake and Abbey and we didn't want to see him with anyone else that we adopted him and made him a permanent fixture.